You wake up to a view of the lake because every bedroom has windows that frame the view. After having breakfast outside with the pier in plain sight, walk down our stairs to enjoy the private beach. But first, don’t forget to browse the library, holding hundreds of books, to read while you’re down on the sand. The house is spacious enough to sleep 14. You can lounge in the large screened porch and take advantage of the family-friendly games and activities found there. The dining tables will accommodate everyone so family stories can be heard by all. Please Note: Water levels and beach conditions change on a regular basis. Some days there is not much beach and some days there is quite a bit of beach. . However, everyday you can enjoy the beautiful views from this house. Bedroom 3: Second level. 2 bunk beds. Bath 1: Main floor. Shower. Bath 2: Main floor. Shower/Tub. Bath 3: Second level. Half bath. Bath 4: Second level. Shower/Tub. Everything was laid out in an orderly fashion and we had no problems at all making our reservations and accessing the property. We love the property and all that it offers us for a great restful and exiting vacation. All our contacts were friendly and helpful, but because everything went so smoothly, we didn't have to call on anyone. We simply loved being at the McNeill house and hated to leave. If circumstances allow, we would love to return. i can't imagine a better place for our family to gather. very helpful. came out to solve a problem. Nice older home on the lake. Air vents dirty and a,few old living room chairs . Comfortable sleeping for 6 adults. One full bed was old and uncomfortable, queen sleeper on porch very poor. Lake view great! Upon returning home we realized that we left our baby stroller at the property and weren't able to come back to get it. The team spent a lot of time and effort to get our stroller to us... thanks so much! We had a wonderful, relaxing time staying at the McGuire House. 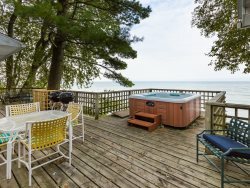 The property is older but clean, and in a perfect lakefront location with a private beach. It's also close to a wonderful playground and to the lighthouse in downtown South Haven. The whole family had a great time and look forward to spending a week together again at the same place next year. The team was very friendly and informative. We had a Great Experience! !Fun Times!! The team was good. Instructions were clear so we had no need for further contact. The house had everything needed for an enjoyable beach vacation. Everything went really well. The pictures posted on line were true to the property. The kitchen utensils were very good. I had called with a question regarding the linens and they called back the same day. Went above and beyond our expectations staff went back to the rental and retrived a library book that I had forgotten and mailed it to me. Initially renting the property was unique because it was not a complete week in the summer. The contact was very helpful on the phone. Other than that, no other contact was required. We had a great weekend! Everything was perfect, the weather, sleeping arrangements, access to Lake Michigan. The retro feel of the house was neat. We called it the "Brady Bunch House" all weekend. Thanks!